By now, you probably know that here at PearsonsRenaissanceShoppe.com, we love all things steampunk! We are constantly learning about new movies, TV shows, comic books – even video games! Steampunk is certainly on its way from being a small fringe trend to becoming a true part of our modern culture. Your interest in steampunk might range from casual curiosity to full-fledged steampunk aficionado. No matter where you are on the steampunk scale, you will always find a place within steampunk culture. If you are a beginner and want to dip into steampunk clothes without going all in, you’re in luck! There are many ways to subtly incorporate steampunk clothes into your daily wardrobe! The easiest way to add a steampunk flavor to your clothes is to first understand exactly what “steampunk” is. In the broadest sense, steampunk is the marriage of Victorian style with science-fiction elements. Think The Time Machine or any other work by H.G. Wells or Jules Verne. There are even some classic TV shows and movies, like The Wild Wild West and From the Earth to the Moon, that feature what we now call steampunk. When you check out these works, you will be able to see the look of steampunk clothes developing. Nowadays, steampunk clothes have very distinct, instantly recognizable attributes. Dark colors like brown and black are primarily used, and dresses, shirts, and pants are often styled to look like a technologically advanced upper class Victorian society. If you want to bring the look and feel of steampunk clothes into your wardrobe, try starting with accessories. Since the steam train revolution plays heavily into the steampunk look, consider accessories with gears, bolts, and other train-related pieces. Our Compass Gear Pendant is the perfect way to bring steampunk into your daily life. 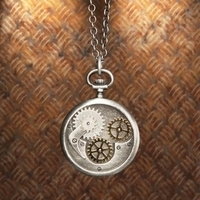 This pendant features gears and antique metal, giving it the look of steampunk you want. If you’re feeling more adventurous, take a look at our Ladies Engineer Shirt. This beautiful shirt is detailed with a brass clockwork button on the collar, adding a subtle touch of steampunk to an already lovely shirt. This shirt will look great in a fully accessorized steampunk outfit or with a normal skirt and cardigan. The best way to incorporate steampunk clothes into your daily wardrobe is to use your imagination! Don’t be afraid to take some risks when experimenting with steampunk clothes. If you come up with a great combination of modern day and steampunk fashion, let us know by emailing pearsonsrenaissanceshoppe@gmail.com! Have fun!